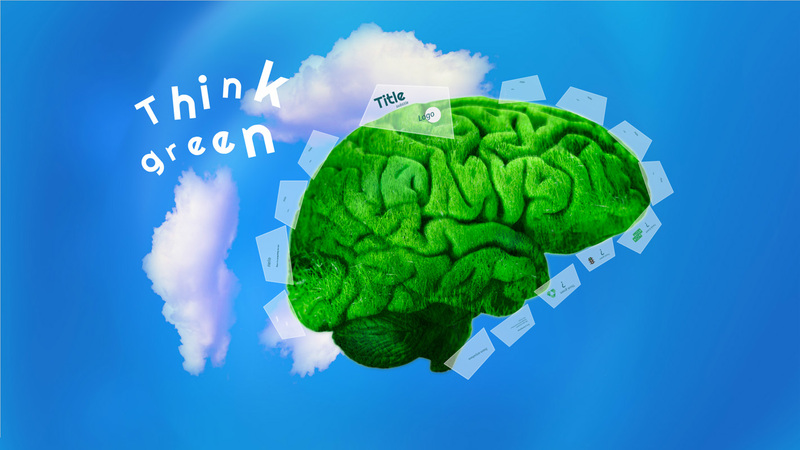 Think green Prezi Presentation Template with green brain covered with grass. Brain showing intelligence and social thinking as healthcare and medicine icon for mental behavior. The human brain is covered with green grass. The metaphor of the wild, natural or imperfect intelligence. Brain image is surrounded with blue sky 3d background and clouds. This entry was posted in Best Prezi presentation templates and tagged abstract, art, background, blue, brain, business, concept, creative, creativity, design, eco, ecological, ecology, environment, environmental, environmentally, graphic, grass, green, growing, growth, head, idea, illustration, intelligence, intelligent, leaf, material, medical, memory, mind, nature, plant, science, sky, steam, Symbol, think, tree.